Vogue Vert Holiday Shopping Event December 1! This past Saturday, Vogue Vert was a vendor at our Seasonably Chic Showcase event and I just found out about a holiday shopping event they’re hosting on December 1. 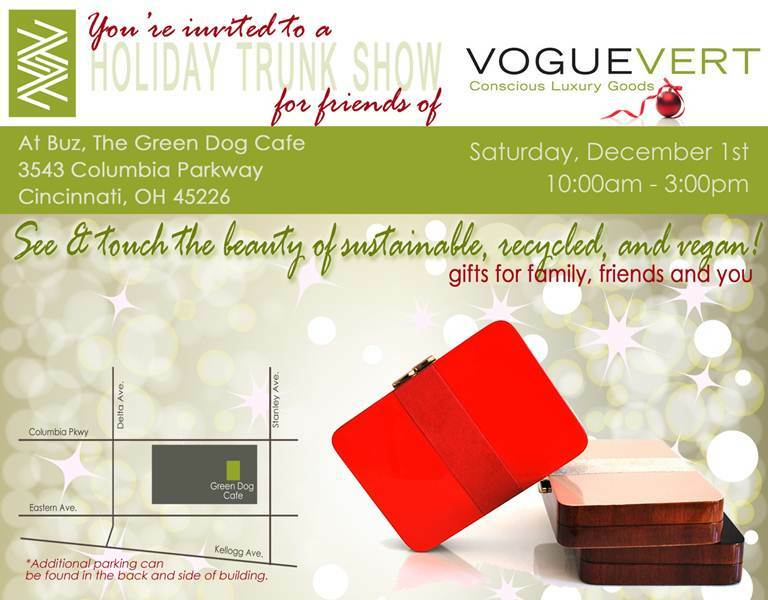 Saturday, December 1 from 10:00am-3:00 pm, Vogue Vert, conscious luxury goods, will be having a holiday trunk show at The Green Dog Cafe. This is the perfect opportunity to pick up sustainable, recycled and vegan gifts for family, friends and yourself! And don’t forget to check out the article that we wrote about Vogue Vert on Cincy Chic. The Green Dog Cafe is located at 3543 Columbia Parkway. Eco-Fabulous Fashion Show Next Friday! I know I already told you about our March Eco-Fabulous Fashion Show, but I have some updates! After we sent out the first email invite, I got a bunch of emails from people who wanted to be vendors. So we added some new faces to the group of green vendors we’ll have at the event. I probably shouldn’t show favoritism among my vendors, but I can’t help myself… the one I’m super excited about is Vogue Vert. They specialize in eco-conscious luxury goods. It was started here locally by a green-minded gal who loves her fashion. So, she launched the site (love the name by the way), forged relationship with green designers, started to sell their items on her site, and gives 10% of her proceeds to the Foundation she founded to provide scholarships to budding green designers. How awesome is that?! So, make sure you come to the event to learn about Vogue Vert, all the other amazing vendors we’ll have there, and the talented DAAP students who will have their designs in the fashion show! Check out the press release below for all the details about the event! See you there! Who said it isn’t easy being green? Cincy Chic, an online publication for women in Greater Cincinnati is not only making it easy, but also fashionable, to be green. Friday, March 16 from 6-9pm, Cincy Chic will host its third-annual “Eco Fabulous Fashion Show” at Lexus RiverCenter in Covington (633 West 3rd Street, Covington, KY 41011). The event will feature a fashion show with 20 looks designed by students from University of Cincinnati’s College of Design, Architecture, Art and Planning (DAAP) program. Each look will incorporate repurposed, sustainable, or earth-friendly materials, dyes and production processes. In addition, the event will feature shopping with several local vendors and boutiques, complimentary refreshments, a photo booth, as well as raffles to win a weekend Lexus lease and raise funds for the Civic Garden Center. The event is free to attend. However, with a $10 donation to the Civic Garden Center, attendees will receive as a reusable Cincy Chic tote bag filled with “swag.” To purchase tickets or make a donation, please click here. The Civic Garden Center, located at 2715 Reading Road, is a non-profit horticultural resource that enriches lives through education, community beautification and environmental stewardship. One hundred percent of all proceeds will benefit this philanthropy. Vendors Include: Bella Forza Fitness, Mary Kay by Britt Born, Votre Vu by Julena Bingaman, A Village Gift Shop at the Century House, Vogue Vert, Stella & Dot with Beth Harris and Summer Weidenbein, and Charmed by Galite.